FinTech Innovation examines the rise of financial technology and its growing impact on the global banking industry. Wealth managers are standing at the epicenter of a tectonic shift, as the balance of power between offering and demand undergoes a dramatic upheaval. Regulators are pushing toward a 'constrained offering' norm while private clients and independent advisors demand a more proactive role; practitioners need examine this banking evolution in detail to understand the mechanisms at work. This book presents analysis of the current shift and offers clear insight into what happens when established economic interests collide with social transformation. Business models are changing in profound ways, and the impact reaches further than many expect; the democratization of banking is revolutionizing the wealth management industry toward more efficient and client-centric advisory processes, and keeping pace with these changes has become a survival skill for financial advisors around the world. Social media, big data analytics and digital technology are disrupting the banking industry, which many have taken for granted as set in stone. This book shatters that assumption by illustrating the massive changes already underway, and provides thought leader insight into the changes yet to come. Information asymmetry has dominated the banking industry for centuries, keeping the bank/investor liability neatly aligned—but this is changing, and understanding and preparing for the repercussions must be a top priority for wealth managers everywhere. Financial Innovation shows you where the bar is being re-set and gives you the insight you need to keep up. 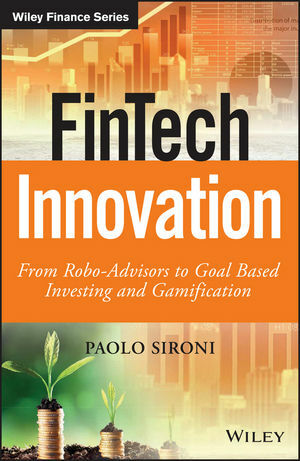 PAOLO SIRONI is a global thought leader for Wealth Management and Investment Analytics at IBM, where he is responsible for promoting quantitative methods, Goal Based Investing (GBI) and digital solutions for financial advisory. His expertise combines financial services and technology and spans over a number of areas, including wealth management, asset management, risk management and FinTech innovation. Prior to IBM, he founded a FinTech startup that provided GBI portfolios to wealth managers. This venture subsequently became a part of IBM following the acquisition of funding partner Algorithmics, a world leader of risk management and investment analytics. Paolo possesses a decade-long risk management expertise; he was previously head of market and counterparty risk modeling at Banca Intesa Sanpaolo. He is the author of Modern Portfolio Management: From Markowitz to Probabilistic Scenario Optimisation, and contributing author to The FinTech Book.